IRS Form EIB-SBA990-W, "Estimated Tax On Unrelated Business Taxable Income For Tax-exempt Organizations" is a tax form issued by the United States Internal Revenue Service. The latest version of the form was released in January 1, 2018. A up-to-date fillable EIB-SBA990-W Form in PDF is available for download below. The "Estimated Tax On Unrelated Business Taxable Income For Tax-exempt Organizations" can be filed digitally and submitted online or printed out and sent to the IRS mailing address. Go to www.irs.gov/F990W for instructions and the latest information. Keep for your records. Do not send to the Internal Revenue Service. Unrelated business taxable income expected in the tax year . Alternative minimum tax for trusts. See instructions . Total. Add lines 2 and 3 . Estimated tax credits. See instructions . Total. Add lines 6 and 7 .
Credit for federal tax paid on fuels. See instructions . enter the amount from line 10a on line 10c . For Paperwork Reduction Act Notice, see instructions. complete Schedule A to determine whether it may be able to lower the amount of one or more required installments. Complete each column of this schedule in its entirety before going to the next column. instructions for the treatment of extraordinary items. 4a Annualized taxable income. Multiply line 2 by line 3.
b Extraordinary items. See instructions. c Add lines 4a and 4b. the same manner as you figured Form 990-W, line 2. Total tax. 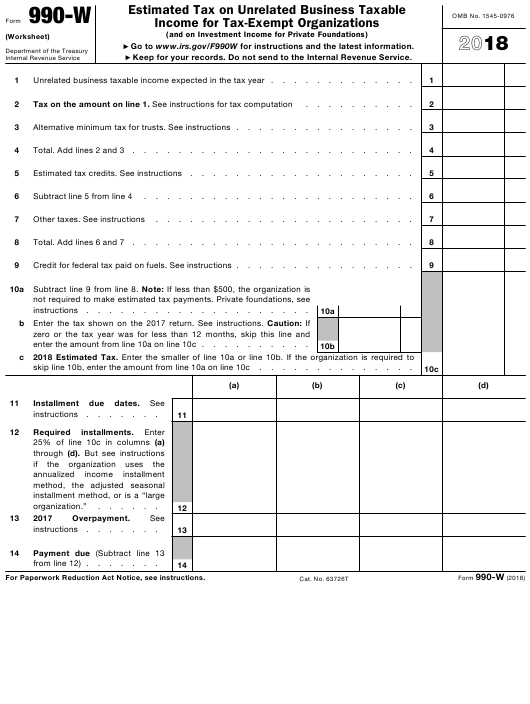 Add lines 5 and 6.
on Form 990-W, lines 5 and 9. See instructions. Multiply line 9 by line 10. Total of all preceding columns of line 40. See instructions. line 11. If zero or less, enter -0-. Schedule A, Part II, for more information. Enter taxable income for the following periods. on line 16a, column (d). on line 16b, column (d). on line 16c, column (d). Add lines 17 through 19. Divide line 20 by 3.0. 22a Divide line 15 by line 21.
c Add lines 22a and 22b. as figured on Form 990-W, line 2.
amount on line 16a, column (d). amount on line 16b, column (d). amount on line 16c, column (d). Add lines 24 through 26. Divide line 27 by 3.0. Total tax. Add lines 29 and 30. 33. If zero or less, enter -0-.
column from line 13 or line 35.
enter the result in each column. preceding column and enter here. Add lines 37 and 38. 39 here and on Form 990-W, line 12.
financial institution to initiate a same-day wire payment on your behalf. for Corporations to determine the amount of tax to enter on line 2. Payment System A Guide to Getting Started. subject to alternative minimum tax. Base erosion minimum tax is entered along with other taxes on line 7. (Worksheet) to figure the organization’s estimated tax liability for 2018.
calendar year private foundation, the first payment is due on May 15. Instructions, in the Instructions for Form 990-PF. income, deductions, and credits for purposes of completing Form 990-W.
the proxy tax imposed by section 6033(e). more information, see the Instructions for Form 4466.
using the 2018 Tax Computation for Corporations worksheet shown below. 1. Enter taxable income (Form 990-W, line 1) . used as propellants in metered-dose inhalers. Form 990-W, line 2 .
your 2017 tax year was less than 12 months, don't complete this line. see the instructions for line 12 below. on recapture of tax credits that must be included on this line. years the corporation has been in existence.